Infographinomicon: WA Senate, Take Two. As the Tasmanian lower-house demonstrated recently, accurate predictions for a fully-transferable vote proportional representation system continue to elude me. The lack of detailed polling is a major factor, though understandable given the number of micro-parties that would either have to be included, or ignored to an extent that makes preference calculations wildly speculative. As a result, we do not even have a recognised system of creating a baseline to measure our accuracy against. The highly inaccurate substitute we will be using for tomorrow is a simple matter of taking the state-wide federal polling and extrapolating quotas from that. Which is always roughly 14.3% of the vote for states where there are six vacancies to fill. 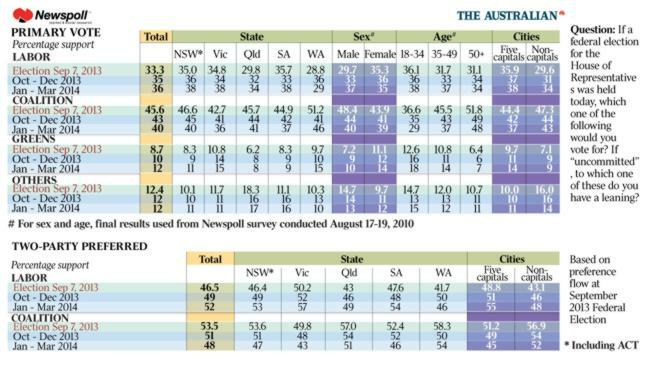 The most recent state-specific polling I could find was the newspoll quarterly, which has the results for WA at ALP 29%, LIB 46%, GRN 15% and Others 10% for the January-March period. Nationally, polling has been trending against the Coalition, so I suspect a slight right-leaning bias to this data. Nonetheless, the baseline gives us nice, clean, primary vote predictions. On first preferences alone, ALP gets two seats (remainder 0.4%), the Liberals get three (remainder 3.1%) and the Greens get one (remainder 0.7%). With all six seats allocated, there is no need to even consider preference flows. Firstly, let’s look at past WA results. The initial plan was to go back to 1948 when the system was introduced, but 1987 (3 ALP, 3 Lib) was complicated by backdating seats, and there was an expansion of the senate in 1984 which saw seven candidates elected in WA, and after that I gave up. Consistently 3 Liberal, 2 Labor and one to whichever minor party holds the zeitgeist of the day. The baseline expectation seems pretty solid at this point. The two counts from 2013 were: 3 Liberal, 1 Labor, 1 Greens and 1 Sports Party; and 3 Liberal, 2 Labor and 1 Palmer United. Either would have been counter-intuitive based on the previous results, though the latter less so if one accepts that Palmer was the valid 3rd party that year instead of the Greens. Palmer could do well in the conservative state and may chip into the Liberal vote. Their preferencing of the HEMP party over the majors has led to speculation that we may see a HEMP candidate in the last seat, but I suspect HEMP will bow out before the PUP. Of more concern is the influence of ‘preference whisperer’ Glenn Drurey, who got the Sports Party (arguably) over the line in 2013, as well as the Shooters and Fishers in NSW and again in the SA Legislative Council. Shooters and Fishers regularly pay Mr Drurey to act for them in negotiations as well, along with Family First and the Fishers & Lifestyle (although I understand F&L have since split due to naming confusion with the S&F). Scott Ludlam’s recent high-profile will cost him nothing – his staunchest critics being devoted to the right anyhow – but will probably win him his seat from the undecided unaffiliated voters. This will cut into the ‘others’ vote but, with electoral fatigue setting in in a state that has recently had a state, local government and federal election in 2013, low turnout is expected (by compulsory attendance standards anyhow). This will predominantly be the apathetic, and may hurt the Labor-Liberal duopoly more than the smaller groups. This, with the suspected right-lean bias in the polling, suggests to me that if a micro-party gets in it will be at the expense of a Liberal seat. However, realistically I can see nothing that suggests anything other than the baseline. Now we have an interesting situation where the prediction matches the baseline. While it would be nice to have a divergent prediction so I have the option of doing better or worse, I’m not going to pick an obscure micro-party for the sake of being different. So the prediction-baseline comparison is not going to provide any meaningful information about the accuracy of my predictions. Instead, we’re going back to the old percentage-point system for this election. Because 90% is passable and 95% is required for a good prediction, we’re either going to do dismally (5/6 = 83.3%) or brilliantly (6/6 = 100%).